At Last! Tickets are on Sale Now! Join us on Sunday, July 22nd at the Coach Barn at Shelburne Farms. Enjoy over 100 Vermont Cheesese along with artisan breads, crackers, pickles, and jams as well as beer, wine and spirits produced in Vermont! The website is live, with all the details on this year's seminars and demonstrations, and photos and video from previous years. New for 2012, become a fan of the Festival on Facebook and share your best photo from a past VT Cheesemakers' Festival in our SAY CHEESE contest. Come out to Billings Farm & Museum Celebrate Vermont's distinctive dairy heritage during a weekend of sampling delicious Vermont cheeses and meeting local cheese makers; dairy education programs, making cheese, ice cream and butter. Mt. Mansfield Creamery’s Sugar Slalom is a bloomy rind cows milk cheese with a hint of maple at the finish. Stan also has a Romano cheese, aged for 6 months in his cave in Morrisville. 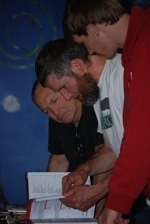 Four new Executive Committee Officers were elected to the Vermont Cheese Council during the Board's annual meeting in Pomfret, VT, January 28, 2012. Planning your summer cheese tour? Download a PDF version today, and you can use our Google Map right now! Plan your day, a weekend, or vacation! Find out who is open daily, who offers tours, and how to make an appointment for those smaller operations and those off the beaten path. To honor those who demonstrate love by volunteering their time, Cabot Creamery Cooperative has launched Reward Volunteers®, the nation’s first mobile app that allows volunteers to log hours, post to Facebook and win rewards for themselves and the organizations they serve. 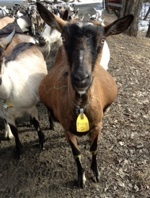 The very pretty Petunia is just one of the very pregnant goats featured in a recent blog post from the folks at Fat Toad Farm. Read the January/February 2012 issue of USDA's Rural Cooperatives magazine. To request a hard copy or for more information contact dan.campbell@wdc.usda.gov. Season sauteed greens with a splash of cider vinegar, salt, fresh ground pepper, and red pepper flakes. Set aside and keep warm. 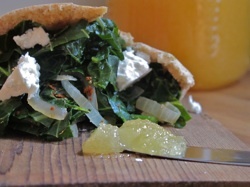 Cut pitas in half (if not freshly baked warm them a bit), spread a thin layer of honey inside the pita, layer with feta and warm greens. Drizzle with a touch of olive oil and enjoy!